We’ve seen this script before. The Oklahoma City Thunder facing the Houston Rockets in a game without Russell Westbrook. This is the second game for the Thunder without Russell Westbrook after his 2nd arthroscopic knee surgery in less than 3 months. They eeked out a win on the road against the Charlotte Bobcats, 89-85, in their last game. In the game, Kevin Durant had 34 points, 12 rebounds, and 6 assists, while Thabo Sefolosha had possibly his best offensive game of the season with 12 points on 3/5 shooting from the 3-point line. The Thunder won the season series against the Rockets 2-1 last season and then met them in the first round of the playoffs. The Thunder ended up winning the series 4-2, but lost Russell Westbrook after Game 2 to a torn meniscus that required surgery. The Houston Rockets come into the game with a 21-11 record and a 3 game win streak. They are the 3rd highest scoring team in the NBA at 106.3 points per game, but are only 20th in opponent ppg, giving up an average of 101.8 points per game. 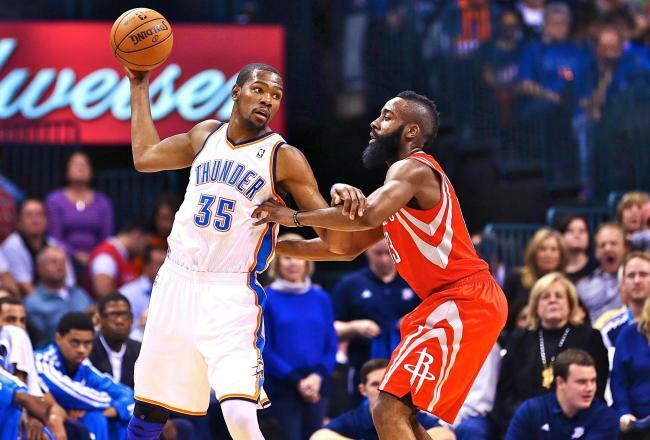 Offensively, the Rockets are a full throttle attacking team, led by former Thunder player James Harden. The 3-wing lineup of Jeremy Lin, Chandler Parsons, and Harden all have the ability to either penetrate into the lane, draw fouls, and make 3’s. Inside, free agent acquisition Dwight Howard is starting to look like the Howard of the Orlando days and not the oft-injured Howard of last season. He’s a walking double double machine, and provides them with semblance of defense. The bench is veteran-laden and scrappy, with players like Francisco Garcia, Aaron Brooks, and Omri Casspi getting minutes for them. 1. Defenders earning their money – This is the reason why Kendrick Perkins and Thabo Sefolosha have a place in our starting line-up. For games like this. Dwight Howard is the type of center that Perkins is made to handle. He isn’t overly adept at offensive and stays in the post. Steven Adams will also be important in defending Howard, especially if foul trouble comes into play. Sefolosha had a lot of success in the first two meetings between these teams last season holding Harden to 9-33 FG shooting. Then Harden erupted for a career high 46 points in the 3rd game. Harden is the type of player that can get hot quickly, but can also be a chucker that’ll keep shooting to get back his rhythm. 2. Perimeter defense – If Perkins and Adams can handle Howard on the inside, there should be no reason why the perimeter defenders need to stray from the shooters. Houston has almost cloned what Orlando had 3 seasons ago, with Howard in the middle and a bunch of shooters around him. 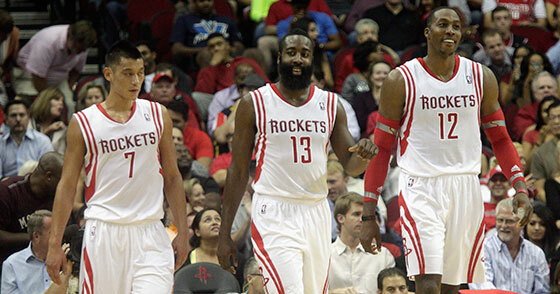 Also, keeping Lin and Harden out of the lane will be extremely important to handling Howard and the shooters. 3. Dribble penetration – While Howard may be known for his defense, the wing players for Houston are definitely not known for their defense. Reggie Jackson, Kevin Durant, and Jeremy Lamb should be able to get through the first line of defense and cause havoc in the paint for the Thunder.